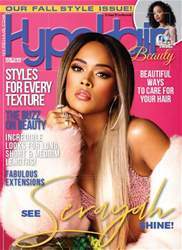 Empire actress Serayah McNeill trades in her curls for bone straight ombre tresses for her latest cover. Inside, she talks with us about new music projects, keeping a healthy hair (and life) balance and beauty faves. Inside: interviews with Beyoncé’s dance captain and 'Hit The Floor' actress Ashley Everett, Luke Cage actress Antonique Smith and Insatiable’s Erinn Westbrook along with your monthly dose of hair and beauty tutorials, hot products and style galleries.